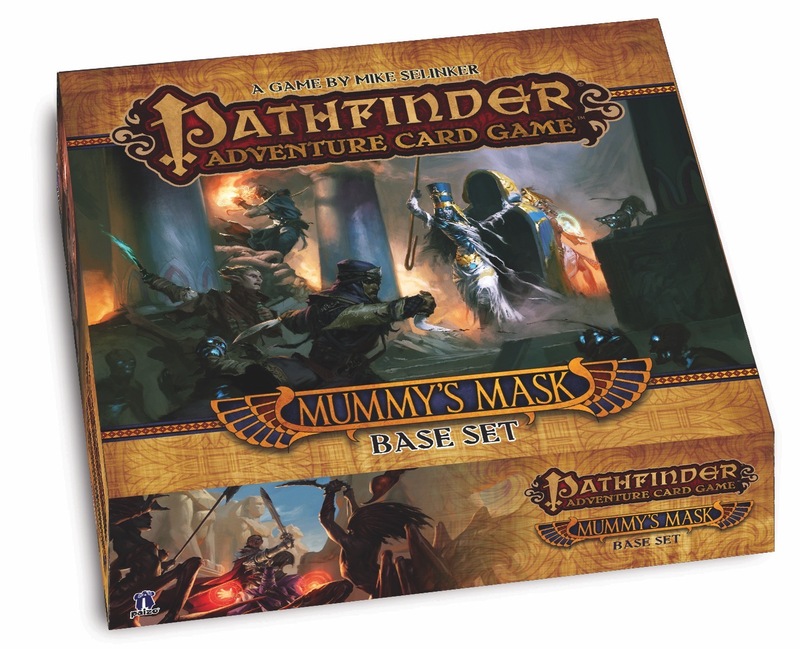 Supplement your Mummy's Mask experience with the Character Add-On Deck, Class Decks, Adventure Decks, or Pathfinder Adventure Card Game accessories (sold separately). OMG^4! So excited for this! The character add-on deck gives names and classes, but nothing here. Looking forward to the previews. With the time lapse since the last release, I wonder why this is coming out in October instead of GenCon. I would think initial sales would be boosted by a GenCon release. It's at the end of my Subscription rope. Maybe if I just pull on it, it will arrive sooner. Any news about which characters will in the base game? We know that Add-On deck will add: Ahmotep the magus, Channa Ti the druid, Drelm the cleric, and Mavaro the occultist. Looking forward to this but need to finish Season 1, 2 & 3 first. The box cover art is final iirc so if you can figure out which characters are on it, that will give some info. I know Zadim has been confirmed to be in the base set back from one of the blogs talking about MM. Has anybody in the UK subscribed? Does anyone know if the customs label on the package is marked 'books' or 'merchandise'? Just wondering if I'll get that hefty import tax if I subscribe, or if it's best just to order from a UK store. One awesome thing Paizo has done in the past (and I'm assuming will do this time too) is let you subscribe to just the Character Add-on Deck. That way, for international subscribers, you can buy the Base Set locally and not pay for the shipping and customs of the larger heavy box. You still get all the promos (since they are tied to the Character Add-on Deck), so it is the best of both worlds. That would be perfect!! I hope that's offered. It's declared as "Games" for customs purposes. Thanks, that's really helpful information. I'm a newer subscriber (started after Wrath of the Righteous was released). Does anyone know if this base set will be included in the subscription or will I have to get it separately from the add-on decks? Thanks! By default, it is included. Base set will be included in the subscription. If you leave your order as is, you will get the base set shipped to you in October. Because of the weight, the cost of shipping is higher than it is for a regular subscription order. This can be especially prohibitive for overseas shipping. Also, some people like to support their friendly local gaming store by buying the base set but still get all the promo cards from the subscription. So for the last two sets, there was an option to cancel the subscription for the base set but still pick up the character addon deck. Thank you both for the replies! I think I'll keep my order unchanged since I support my FLGS plenty in other ways :). I'm looking forward to this one as I like the ancient Egyptian theme and artwork. I am definitely going to hold off on buying this until after reading reviews. The base game of Wrath was so punishing, it wasn't fun. I still don't know why I even bothered even trying to play the game after it. I really hope that this new has been more thoroughly play-tested to keep poorly designed cards such as Arboreal Blight (I seriously cannot understand how anybody thought that card was a worthwhile inclusion) and Demonic Horde to a minimum. The character add on deck is what makes player counts 5 and 6 possible. The base set alone doesn't include enough cards for that. I am teasing with the idea of jumping back on board the PACG train as the best series of games I have ever played with my wife were from the first set. We bought everything (and I mean everything) for the second set, but found the boat mechanic fiddly and the theme not very interesting (even as a rl sailor and lover of nautical things). The third set was a pass because it was touted as challenging game with a 20 sided dice and cohorts which all seems fiddly, but I admit we did not even try. Which mechanics are we to see in this set? I'm not sure everything has been publicly revealed yet, but the two things people have mentioned either from announcements at PaizoCon or playing the demo are Triggers and Traders. Triggers are cards that have something happen when you examine them as opposed to when you encounter them (for example, when you play Augury or Spyglass). Traders are ways for you to trade cards you have at the end of a scenario for other cards. I'm not sure there has been much more than that about new mechanics that has been said yet. But I'm really excited for this one. So is Mummy's Mask still on track for early October? Are there any previews yet? Now that it is September, my group is getting hyped for the preview that will likely come in a couple weeks. The long break was nice because it gave us time to give SnS a play-through, and a second round of WotR. That being said, we love being on the bleeding edge. Things on WotR like Radiance upgrading to Holy Radiance are so fun if you have no idea it's coming. Of course, this community and people like Hawkmoon make playing on the bleeding edge possible. Thank you all. Can. Not. Wait! And we need Iron Gods next! Does any promo card come from the base set itself or is that just the add-on decks? Can I keep my subscription for the add-on decks but buy the base set big box locally? As the email I got as a card game subscriber explains, any promo cards that ship in the first month are paired with the character add-on deck. Paizo offer the card game subscription in two variations - one that starts with the base set plus the add-on deck, and one that starts with the add-on deck. If you don't want to buy the base set box for any reason (extremely high international shipping charges, just wanting to patronize your local game store, ...) you can contact customer service to cancel your current subscription and re-start with the add-on deck. There are no promos associated with the base set; all promos are associated with the Add-On Deck and subsequent Adventure Decks. This is to enable a situation exactly as you described where you can pick up the base set elsewhere without missing out on anything. This is especially important for people who live overseas since they may be paying $50+ in shipping for the base set if they get it from Paizo. When do the character sheets for a new adventure get posted? Usually when the product hits its street date. Minor typo in the Quick Start Guide. I suspect there should be 2 boons to each location rather then the printed 3. I thought I had read somewhere that Mummy's Mask had cards with hidden text and you would have to use a special reader(not sure the name of it) to see the hidden text (when instructed to do so). Did I dream that up? I didn't find anything like that in when I opened up the game. Can we get the rulebook uploaded for this set? No, there is no such thing in Mummy's Mask. That was only a joke a poster made after Vic had teased about some "new technology" being used in this set. However, Vic was only referring to the red highlight used for the Trigger trait. LOL, I guess the joke is on me. I would like to see the rulebook too! So much new things were introduced. Where is the rulebook in PDF? Where are the character sheets in PDF? Why bother to buy the game until these tools are available? I can't start up a group until we can all get a copy of the rules on our tablets nor print out sheets at a larger size so we can actually read them and write on them rather than the small cards. PLEASE release the PDFs soon! The .pdf sheets would help a lot. I'm checking every day till Paizo release the sheets. Thanks for putting up the rulebook, but the link doesn't seem to work. I have the same problem as Zaister. Rulebook link does not work. Have they released the PDFs for the character sheets yet? Yes - they are in this download. Yes, you'll find them here. Is there a list of how many cards there are in each set anywhere? There are listed on each product page for that product. If you look up above, there is a grey box that says Downloads. In it is a link labeled "Base Set and The Half-Dead City Card Lists". That will give you the list for this product. You'll find similar lists on each product page.